Here at Barrier Group we strive to be the very best at what we do. We work together across all development phases to create a strong and durable design from a brand you can trust. From the very beginning of conceptual design onto our highly skilled product development team, to manufacturing right on through to our sales consultants we aim to provide a high standard of quality, design, manufacturing and service. We have researched and sourced the best materials, components and fixings to work with to ensure the strength and durability is maintained throughout all of our product ranges. You may have seen "cheap" versions of products similar to what we sell here. You might have even taken the risk of purchasing a product based on price rather than quality assurance and encountered faulty goods or parts in the process. Current "cheap" products that rival us in the industry are generally found to be competitive in price* but lack the value, sustainability and durability that we pride ourselves on. These products compete with, but are not limited to, our bollards, speed humps and wheel stops. Other wheel stops in the market today can not only be constructed from unreliable, cheap materials but they do not comply with Australian Standards for wheel stops. 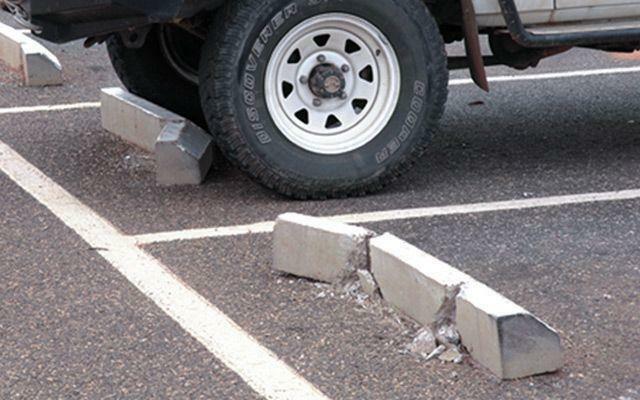 Concrete wheel stop dimensions are generally 50mm higher than the Australian Standards recommendations which can damage the front of most modern vehicles as they park. Concrete is brittle, unforgiving and prone to cracking and breaking up exposing hazardous spikes which can mean recurring costly replacements. Some plastic models are manufactured into an unreliable construction from cheap plastics known for warping and bending up at the ends. This not only causes the fixings to loosen but make the wheel stop insufficient for your needs. "Cheap" rubber models soften or move in extreme weather conditions which lessens the strength of the product and causes the fixings to work loose from impact over time. Due to the nature of these materials, the concrete, plastic or cheap rubber wheel stops may end up costing you more over time for replacing faulty, damaged or unreliable models. How do our wheel stops measure up against the competition? 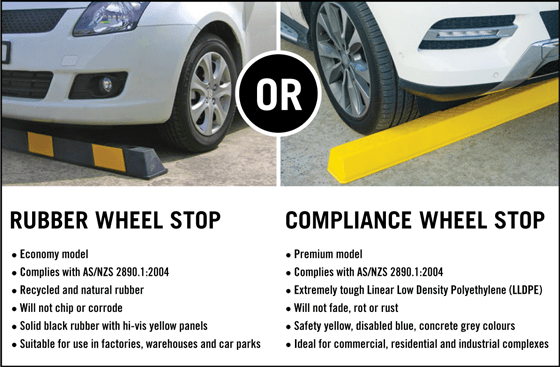 As demonstrated in Table 1, both models are manufactured to comply with the Australian Standards 2890.1:2004 for wheel stops and can be installed into any car park or parking facility. Other comparisons to consider when making your purchase include the environmental sustainability, weight and cost. Aside from concrete, the most commonly requested model is the rubber wheel stop. Our rubber model not only has a solid moulded recycled and natural rubber construction weighing 14 kgs, they are more affordable, easier to install and come complete with fixings. As a green alternative to the rubber model, the compliance has world first features never before seen in a wheel stop which makes them better for the environment during the manufacturing process and after-life recyclable abilities. Compliance wheel stops are constructed from Linear Low Density Polyethylene and have an internal structure that combines incredible strength and flexibility with four fixings points allowing for greater impact resistance. Weighing a mere 5.5 kgs they allow for easy one person handling with a choice of three fixing systems for installation into asphalt and bitumen, reinforced or shallow concrete. Deeply recessed mounting points are designed for maximum hold down and finished with blanking caps that not only conceal the fixings but also provide a flush finish to complete your wheel stop installation. In conclusion, if you want maximum strength and durability or if you have any concerns about climate change and the environment - buy compliance. Ultimately, the decision between the two all comes down to you and what you need from your wheel stops. To help you decide, read more product information for the Compliance or Rubber wheel stops and follow the prompts to request a quote. 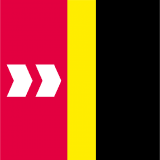 We are the brand that you can trust! *Our competitors generally do not include fixings in their online price and you are often paying equal to more of what we have advised due to the added extras that you will need to complete your purchase ready for installation. Most to all of Barrier Group product pricing includes fixings.